Photograph of the the of base of shrine walls of the Changdeva Temple, Changdeva taken by Henry Cousens in the 1880s or 1890s. Changdeva is situated in modern day Maharashtra. The town is home to two temples, the Changdeva temple and the Ahalyabai temple. The former is pictured here and consists of a sanctuary and a mandapa, or porch, facing east. The sanctuary is dedicated to Vishnu although the shrine now houses an image of Changdeva. Extensively rebuilt, the manner in which modifications were undertaken was described at the time this photograph was taken as "outrageous". The original walls still survive up to the cornice and are heavily decorated but they have been shored up in places with large quantities of mud bricks. In general the structure is in a poor state of repair, the roof of the mandapa has collapsed as well as some of the pillars. 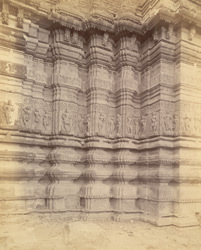 This photograph shows an external view of the sanctuary walls which are decorated with broad sculptured bands with female figures in high relief.